How Fast Do Fig Trees Grow? Do Fig Trees Grow Better in a Pot or in the Ground? 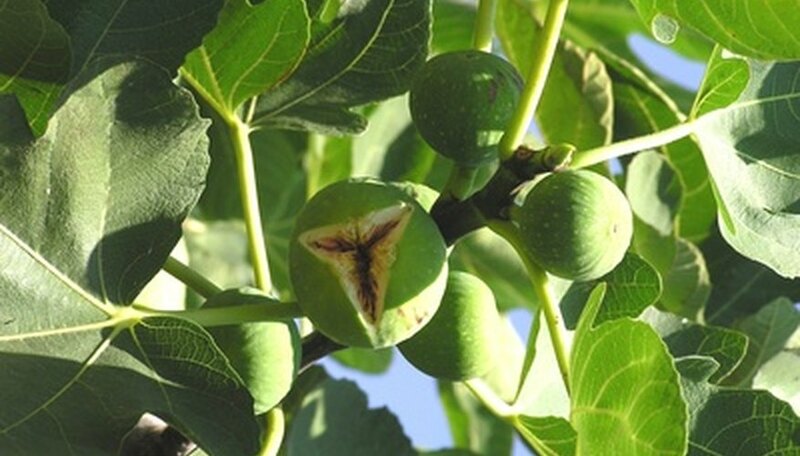 Fig are small, attractive trees that produce small fruit that some consider irresistible. There are several varieties of fig, and most of them are susceptible to a variety of diseases. But few of them affect the fig's leaf, making diagnosis a relatively easy task. Fig rust is a common leaf disease that causes light orange spots on fig leaves. As the disease progresses, the spots grow larger and the affected leaves eventually drop. To treat fig rust, prune the affected leaves. 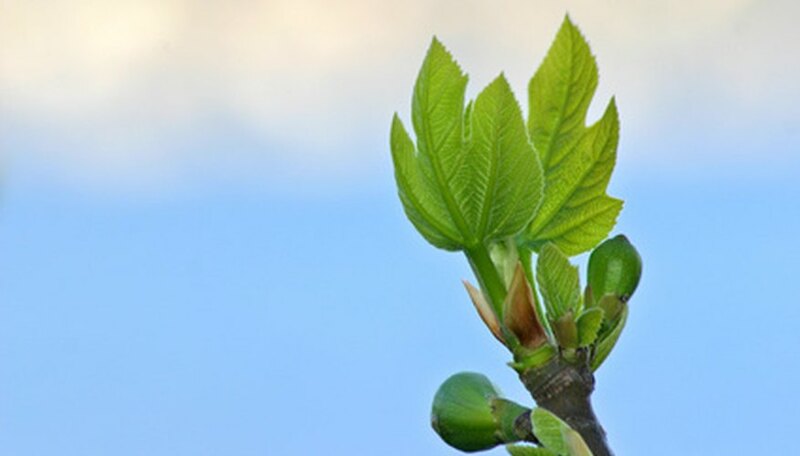 Then, in early May or June when the leaves have reached full size, spray the fig with two applications of neutral copper spray administered in one-week intervals. Fig mosaic is a fig tree leaf disease caused by a virus. Affected leaves develop large yellow spots, and lightened veins are smaller than the other leaves on the tree. Eventually, leaf and fig production become severely reduced. 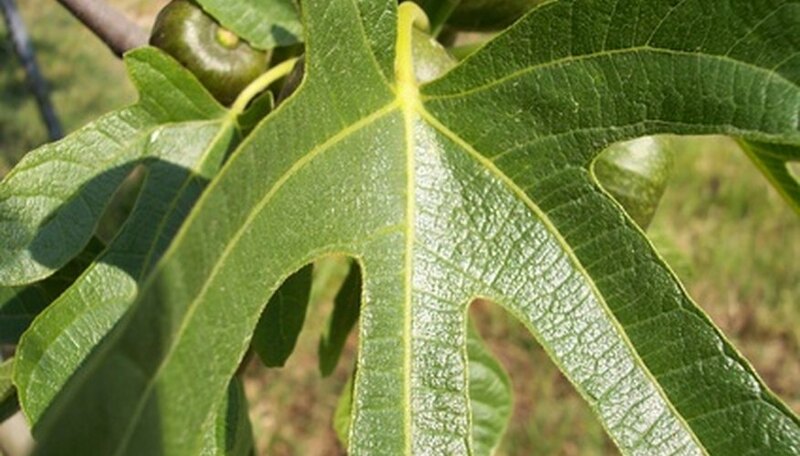 Since fig mosaic is a virus, the only remedy is to plant another, uninfected fig tree. Botrytis blight is a fungal disease that often crops up after an unusually cool and wet spring or summer season. The leaves and fruit of an affected fig tree develop brown spots that may house silver-gray fungal spores. To control the infection, prune all affected plant material immediately and remove any leaf litter from the base of the tree. To protect the tree from further infection, apply a neem oil spray to the tree in early spring. Skip fertilization the first year after planting. While many trees are fertilized after planting, you should not fertilize brown turkey fig trees. Fertilize only when necessary, in the spring after new growth begins. 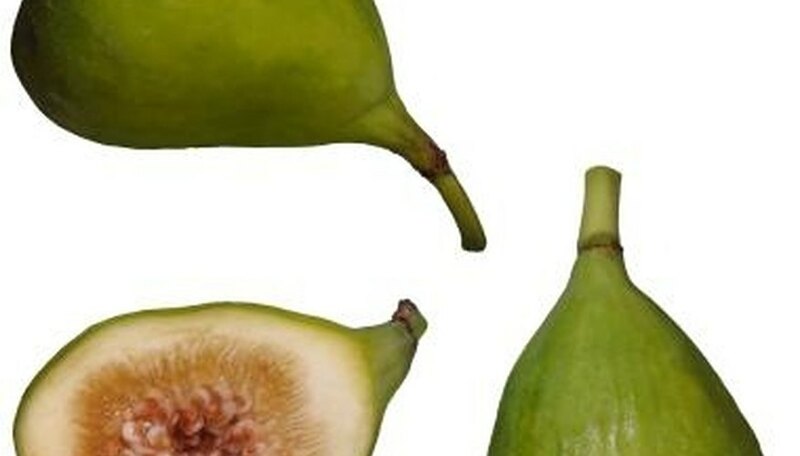 If your brown turkey fig trees have been healthy, produced good figs last season and have lots of new growth compared to other trees in the spring, then do not fertilize it. Using fertilizer on fig trees has the potential to increase green growth, but reduce fruit growth. Fertilize using just a half of pound of a low-balanced fertilizer labeled 10-10-10 in the spring after new growth begins. Follow manufacturer directions, as each fertilizer is different. Generally, however, scatter the dry fertilizer evenly in a 12- to 18-inch circle around the base of your brown turkey fig trees. Cut away pieces of the plant that are 3 to 6 inches long and have a thickness between that of a pencil and that of a finger. Make sure that the fig cuttings contain some of the wood from the previous year and are not all new wood for the best results. Line the bottoms of individual planters with newspaper. Add enough potting soil to the planters to allow the cuttings to stand upright. Place one to four cuttings in each planter, fill the planters the rest of the way up with potting soil and water the soil until moist. Place the planters in a bright warm place that does not receive direct sunlight. The cuttings will root most effectively in temperatures above 70 degrees F.
Water the cuttings only when the soil is completely dry. Set each planter in a pan of water and let it draw the water up into the roots. Once three to five leaves have emerged on each sprout, transplant the rooted fig cuttings directly into the ground or into larger pots. 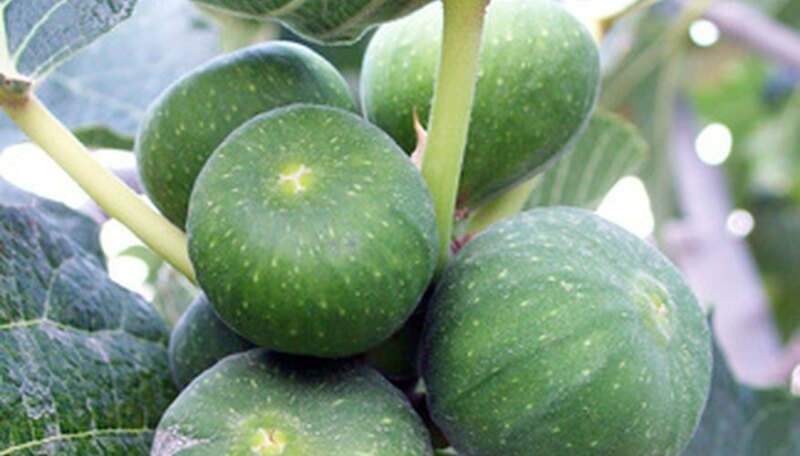 Use a balanced fertilizer, such as 8-8-8 around the base of the new fig plant to encourage growth. Determine a pruning schedule for your tree. Typically, pruning occurs immediately after the figs have been harvested. Brown turkey fig trees bear fruit on the previous year's wood growth. Pruning too early in the season may mean you prune away all of the fruit-producing wood. Determine the approximate age of your fig tree. Pruning is most important during the early years of the tree's life, especially the first five years. If your tree is less than 4 feet tall, chances are it is less than 5 years old. Most of the pruning needed for young trees serves the purpose of shaping them. Prune your fig tree with pruning shears. For a young tree, cut the crown back; shorter trees make for easier fig harvests. For trees of any age, prune back any dead or damaged branches. Clean up your pruning with pruning snips. Use the snips to remove twigs or very young growth that is too small to cut with your shears. When doing this, you can prune some of the offshoots from the main branches, although this is not necessary. Check the height of the tree. Determine if the tree is between 10 to 30 feet high. This is typical for fig trees. Look for twisted branches that spread outward to a width greater than the tree's height. Inspect the tree's leaves. Look for green, palm-shaped leaves that have three to seven lobes and are 10 to 12 inches long. The leaf should have a rough texture on top. Check the bottom of the leaf as well. Fig tree leaves have hairy undersides. Check the tree's fruit. Look for a fleshy, pear-shaped or egg-shaped fruit that is up to 4 inches long. The color varies from green to copper to purple. Look for a tiny opening at the apex. Cut open the fruit with a knife. Find the tiny flowers massed along the inside of each fruit. Look for the seeds, which can vary from 300 to 1,600 per fruit. Observe the number of crops the tree produces over the course of a year. The fig tree produces two crops per year. The first crop is called the breba crop and occurs in spring. The second crop, or main crop, comes in the fall. The best time to prune fig (Ficus carica) trees in the South is after their fruit ripens in early summer. Fig trees fruit on their previous season's wood. Pruning at this time lets them set buds for the following year. Winter-pruned trees may lose their entire crop. Plant fig trees in full sun, preferably along a south-facing wall. They must have well-drained soil and are hardy to zone 8. Mature, dormant trees can withstand temperatures as low as 10 degrees F.
Fig trees typically reach a height of 10 to 30 feet, but they are capable of growing up to 50 feet tall. They tend toward a spreading, multiple-branched shape rather than an upright shape, notes California Rare Fruit Growers. Healthy fig trees should grow as much as 1 foot per year. If your fig trees makes 1 foot of growth in a year, don't fertilize the tree. If you receive less growth than that, fertilize to encourage optimal growth. Use nitrogen fertilizer if you need to give your tree a boost. Fig trees need full sun to ripen the fruit, but too much sun may damage the bark. California Rare Fruit Growers recommends painting your tree trunk with white paint to protect it fron sun damage that can harm your tree. Massachusetts has extremely cold winter months that cause the ground to freeze for long periods of time. Because of this fig trees are best planted in early spring to early summer. It is best to keep the tree as a potted plant so that in the winter months the trees can be kept in a covered area where it will not freeze. Plant your Kadota fig as quickly as possible after purchase. Use care not to expose the young fig tree to hot breezes before tucking its roots into soil. All fig trees fruit best in a Mediterranean-style climate and Kadotas particularly require sunshine all day long. Give the tree lots of elbow room; Kadotas are fast-growing trees with wide branches and spreading roots. Water young trees regularly the first summer season and every few weeks when mature. Look for yellow, drooping leaves, a sign that the Kadota is not getting enough water. Spread mulch around the tree to preserve moisture and provide protection from weather extremes. Trim your Kadota fig tree annually to limit growth. Use your pruning shears to reduce the size of upper branches to facilitate the harvest. Trim the tree to 10 to 12 inches from the ground just after planting. Reduce all growth to 16 to 18 inches the second season and thereafter. Forbid vehicle passage under a Kadota fig tree. Car or even bicycle tires damage its spreading surface roots and may kill the tree. Harvest your Kadota figs starting in June. Although this fig cultivar does not produce an early breba crop, some mature Kadotas produce figs through September. Allow the figs to ripen on the tree since they will not ripen further when picked. The curtain fig tree is the common name of this unique tree. Its section of the genus Ficus is Conosycea. The curtain tree's family within the section is Moraceae, and it belongs to the tribe Ficeae. 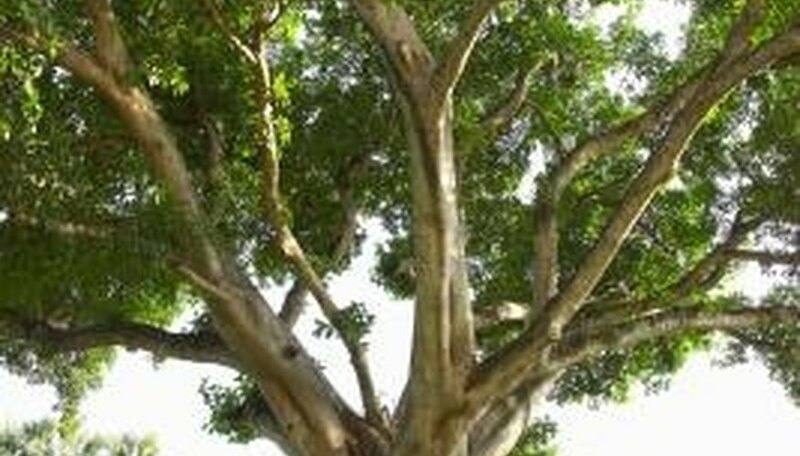 The curtain fig tree has knobby, gray, woody branches. The plant produces long strands of ropey roots that hang from the top of the tree, extending to the ground. These roots are so plentiful that they create a cascading curtain of hanging roots. Curtain fig trees are found only in rain forest areas in Australia. The trees are not able to survive anywhere else. The curtain fig tree is a parasitic tree. Self-sowing, it attaches itself to the uppermost branches of host trees. The curtain fig produces cascading roots that extend to and penetrate the soil beneath the host trees. The roots attack the host trees' root system, and the curtain fig eventually kills and overtakes the hosts. A 500-year-old specimen of the curtain fig tree is in Yungaburra on the Atherton Tableland in Australia. The tree has been a tourist destination since the 1920s. Remove any damaged, dying, dead or diseased branches, fruit and foliage that you find. Cut back any branches that cross and abrade one another back to their parent branch. Pull all cuttings from the canopy and collect them up from the soil to prevent the harboring of disease. Thin the interior branch structure sufficiently to ensure that sunlight can easily penetrate into the fig tree canopy and air flow is good between the branches. Cut the ends of the branches as needed to reduce the size of the canopy. Cut back any upright water sprouts or sucker growth from the trunk. Trim the shape of the fig tree canopy to be more symmetrical, round or distinctively tree or lollipop-shaped as you desire. Remove only as much plant tissue as needed and never more than one-third of the canopy in any one session to prevent stress and shock to your fig tree. Fig trees grow well in the ground with 8 hours or more of sunlight and heat. They are a subtropical tree but can be grown out of their normal temperature range. In the case of growing fig trees in a cooler climate, they grow better in a pot. Prune your magnolia fig when dormant, either the fall or winter. Fall pruning will result in a summer fruit crop the following year, while winter pruning will result in a fall harvest the following year. Thin the interior branches of older fig trees that are slowing their fruit production or to increase the size of the fruit on the remaining branches on still heavily producing trees. Remove up to one quarter of the interior branches evenly throughout the canopy down to the parent branch, and discard the cuttings. Trim away any discolored, dead, diseased, cracked or otherwise compromised foliage and branches. Also trim away any weak branches or upright water sprouts that appear in the canopy to encourage lateral branching instead. Maintain an upright tree form on your magnolia fig by trimming off all branches and water sprouts that grow below the one-third to halfway mark up the trunk. This changes the natural shrub form of the fig and can reduce fruiting capacity, but is not harmful to the tree.